Individual lessons for children and adults in Piano, Voice, Flute, Violin, Guitar, Saxophone, Clarinet, Trumpet, Cello. 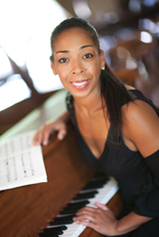 The Academy Director and Founder Ellen Annor-Adjei studied piano from the age of five and subsequently attended the Musical College of Moscow State Tchaikovsky Conservatory. She has appeared in numerous recitals at the Arts & Letters Club, the Toronto Centre for the Arts, Glenn Gould Studio, and the Four Seasons Centre for the Performing Arts. Ms. Annor-Adjei has extensive teaching experience in Europe and North America. She was on the faculty of University Settlement Music and Arts School from 1996 to 2011 as well as continuing teaching privately and coaching chamber groups. One of the important objectives of Musical Arts Academy is to provide students with a more well rounded musical education. We encourage our students to attend group classes which are very beneficial in the development of their musical education. We are also giving students opportunities to perform frequently in front of audiences. This sets goals for the individual students and helps them to develop self-confidence. Music is the form of art which makes our lives rich, enjoyable and complete. Please, look at the Star Potential Studios website for details. Musical Arts Academy © 2018, Graphic Design: Alexey Konkin.